October is finally here and I could not be more excited! It's not only my favorite month because it's my birthday and anniversary month, but it's just such a happy and tasty time of year! I plan on eating pumpkin-something dessert, every weekend, until Christmas. And then it's Christmas cookie time and I never hold back. We are usually really really good about not having sugars other than natural sugars like fructose (fruit sugar), honey, or maple syrup, but over the last few weekends, we have had some kind of refined-sugar filled dessert. They were absolutely delicious and I don't regret a thing, but it is starting to take a toll on my body and I know I need to take a little break. For me, not having refined sugar is completely because of how it makes me feel and how my skin reacts to it. It has nothing to do with trying to lose weight, fat, or look better. Within an hour of eating desserts or candy with refined/white sugar, I get a terrible headache and nine times out of ten will get a pimple on the center of my forehead. I kid you not - it is every single time! It makes me feel like blah, my skin hates me, and there are a million other things that I can eat! That's really where my love for 'healthier' treat recipes come from. I'm a candy, chocolate, cookie, everything-sweet lover at heart, but I hate the way it makes me feel. Once I started making my own recipes and opting out refined sugars for honey, maple syrup, or even just nut butters, I realized that I can have the best of both worlds. My healthy treat recipes are intended to satisfy a sweet tooth, keep you feeling satisfied, and nourish your body with beneficial nutrients. There is absolutely zero benefit of refined sugar, so why put it in your body? Another not so fun aspect of having real sugary treats every weekend, is dealing with that mid-week craving. And I'm talking that, I don't even care give me five chocolate bars stat, feeling. It's a hard feeling to be open to, and it's an even harder feeling to deny. It's really important to understand that sugar does effect your body and brain in this way. When we give our bodies refined, processed sugar, it causes the release of dopamine, your happy hormone and insulin, a hormone that breaks down food and helps make it into your bloodstream. Both hormones are necessary for proper digestion of sugars in the body; however, our bodies know what we like and by releasing our happy hormone, we are telling ourselves to go back and eat some more. We then crave sugary treats long after we thought we could just settle for one piece and before you know it, you're having cake every single night. My trick to getting back on track without the harsh cravings is simple: snack smarter. But really though, I would be lying if I told you that I didn't have these mid-week cravings! I'm human and I try my best to feed my body with the best ingredients possible, but I'm human and I love enjoying pumpkin pie on my birthday. There is nothing wrong with that either, life is way too short not to have dessert on the weekends and enjoy some not so 'clean' things every once and a while. 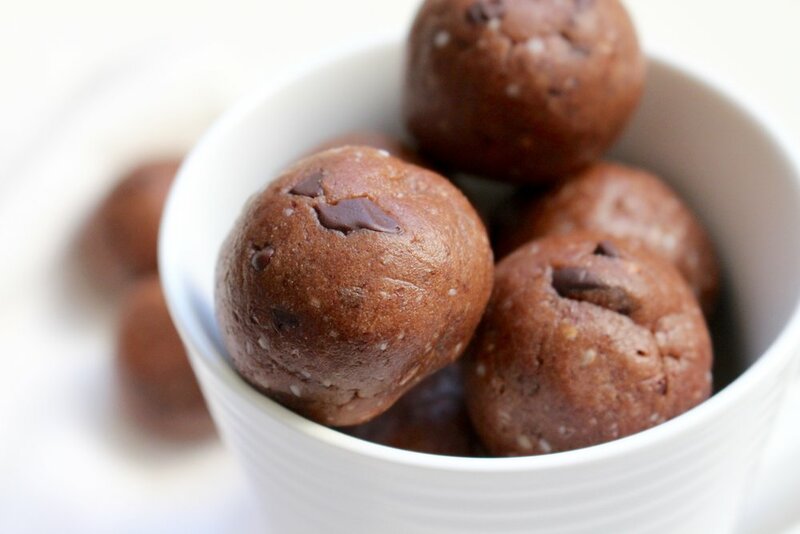 Protein balls are my absolute favorite snack to have on hand during the week. Most of my recipes under "Snacks" are bites/ball recipes because I love them that much! Whatever kind I make, or which ever ingredients I use, they always turn out incredible. Not to mention beyond easy! All you need is a food processor and the possibilities are endless. I always keep them stored in the fridge so they're nice and fudgey by the end of the day and they make for the perfect late night, sweet tooth treat! This recipe is all about chocolate chunks and a creamy texture. Cookies and cream desserts are definitely one of my favorites, and these balls hit the spot! The ingredients can be as minimal or extent as you want and can easily be substituted for what you have on hand. I hope you love them as much as we do and feel free to leave any questions or comments below! Using a food processor, blend together the dates, nut butter, pecans, and sesame seeds until the consistency resembles little pebbles or "pearls." Next, add in the protein powder, honey, and single tablespoon of water. Blend on high until the mixture begins to pull away from the blender completely. This will look like a big ball of spinning dough! Once you've reached a creamy yet stable consistency, add in dark chocolate chips and pulse until they are just combined - not completely mixed. You want to have chunks of chocolate rather than melt the chocolate into the mixture itself. Place in the refrigerator for at least ten minutes to set. This will make rolling much easier since these do have a bit of natural oils in them! 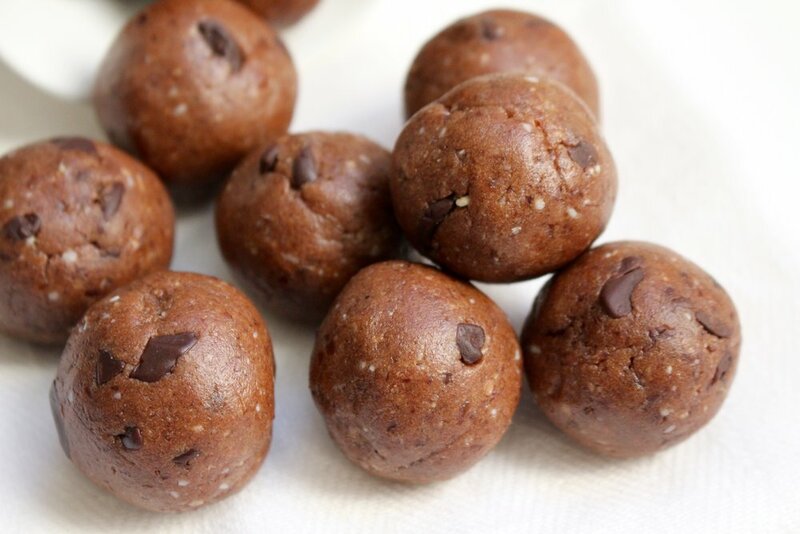 Roll the mixture into 15-18 one-inch balls and store in the fridge for up to two weeks. 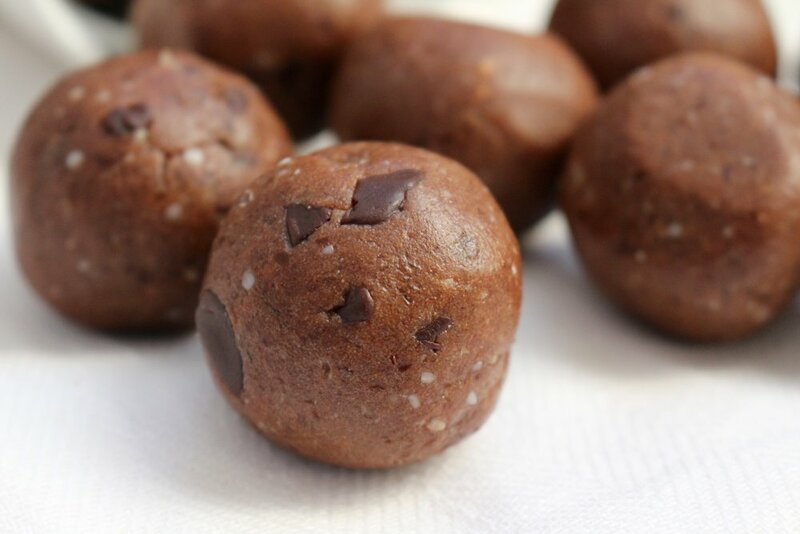 You can also keep these in the freezer for added freshness and a cold and healthy treat!